Additional Notes: From Brawl/Mother 3. It owns just play it. Seemed like a pretty fun file, but there was double stepping in it that made me not want to bring this to the arcade. There is no double stepping. You can flow the whole thing. Except for the long holds obviously. You probably shouldn't try to cross those over. Pretty fun, the long holds were easy, I think I treated two or three as jumps and FA'd them all so no complaints. Just being picky, but the song itself didnt appeal to me. Good steps though. 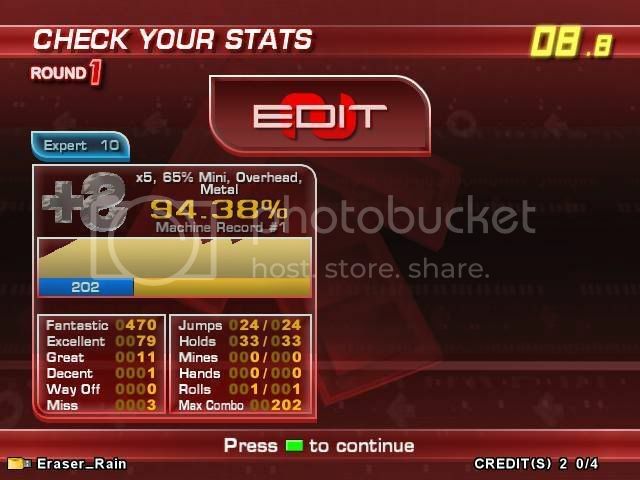 99.23, I felt this was a good score due to BPM changes and 24ths that are unusual but definitely belong there. Very fitting chart. Great arrow placement overall, and progression along with the music. The last few measures are probably the best ones I ever saw.